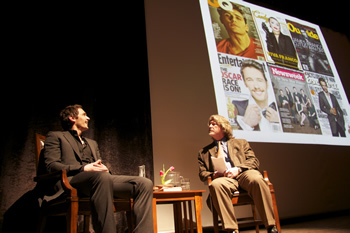 There was a giddy buzz on Pearl Street leading up to James Franco’s appearance at BIFF. The guy is a mad scientist who doesn’t sleep much, some were saying with varying levels of direct and indirect knowledge. Mostly indirect. Arna Gordon, who earned a degree in NYU’s film program, attended classes with Franco and noted his quiet demeanor. She also recalled one class in which a film instructor ripped on the movie Milk, failing to realize Franco, who co-starred in the production, was sitting right in the front row. The rumor mill was churning out stories about problems with Franco’s travel arrangements. There was some uncertainty, some were saying, as to his schedule and the availability of commercial flights. In the end, so the mill said, he flew into Centennial, not exactly in spitting distance of Boulder. The flight situation put Franco on edge a bit, setting up the possibility of an evening made interesting in unintended ways. Also overheard was chatter that he’d been up for 16 hours straight and was to depart on a flight back to Los Angeles immediately after his Boulder gig. Of course, in one week’s time, he’ll be back on stage, in L.A., co-hosting the Academy Awards with Anne Hathaway. If all of that travel grist is indeed true, then Franco’s a trooper; both he and BIFF should be commended for sticking to the plan and making it happen. After all, his appearance at the Boulder Theater to receive BIFF’s Vanguard Award was sold out. Also on the evening’s agenda was The Clerk’s Tale, a short film directed by Franco. based on a poem by Spencer Reece, the movie documents the mundane life of a clerk in a menswear store. He dutifully dresses mannequins, chats up customers while trying to make a sale, and observes an old codger of a co-worker who repeatedly tells the same dirty joke. It’s a light, harmless piece that sets the stage for Franco taking on more directorial projects down the road. Yes, Franco most certainly seemed detached and reluctant to loosen up Saturday evening, even after Boulder resident Aron Ralston, whom Franco portrayed in 127 Hours, gave a fantastic, typically humorous introduction of his cinematic doppelganger. A little uneasy under the spotlight and perpetually gazing up at the rafters, Franco provided some high-level insight into his non-stop activities, but it was hard to marry the calm, cool cucumber on stage with the guy hamming it up for a half-dozen magazine covers splashed across the screen backdrop. Maybe, just maybe, Franco’s life really is the ultimate story of serendipity. For example, apparently work in the Judd Apatow flicks Knocked Up and Pineapple Express led to an ongoing series of humorous, self-effacing Webisodes entitled Acting with James Franco. But Franco’s also put in a lot of study time, as Bostwick rattled off a number of educational institutions Franco’s attended over the years, having returned to formal classroom environments after dropping out at 19 in order to make his mark. His gamble paid off, with roles including Harry Osborn in Sam Raimi’s blockbuster Spider-Man trilogy, The Green Hornet, and even a recurring role on General Hospital last year, well after his rise to stardom. As he stated, he’s in a position now where he typically works during the summer, affording plenty of time for other pursuits while not on the set. Toward the end of Bostwick’s interview, when asked if he was nervous about the Oscars next weekend, Franco shrugged it off with an odd, cold indifference, pausing for a moment before finally saying, “Whatever.” All the while staring up at those rafters. Maybe even mad scientists, particularly those pushing 33 years old, need some sleep.